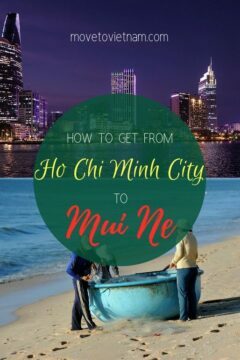 If you are backpacking in Vietnam and starting in Ho Chi Minh City, there is a big chance that you will want to go to Mui Ne. Either through your research or from other travellers that you meet and gave you suggestions. Mui Ne is a beach town known for its water activities such as kite and windsurfing. 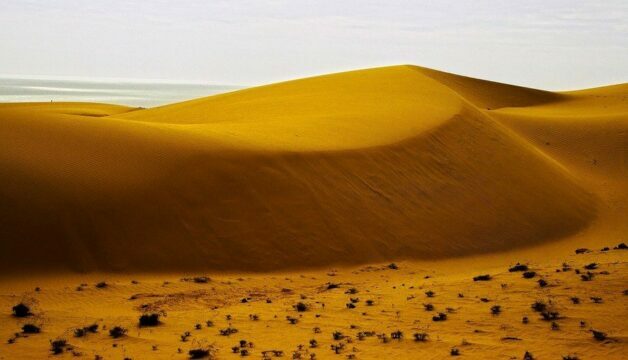 It is also known for its red and white sand dunes, which is both great spots for sunrise and sunset. You also should not miss visiting the fairy stream and fishing villages. You can easily rent a motorbike here and drive around yourself in the city and suburbs. There are two popular ways to get to Mui Ne from Ho Chi Minh City. One is to take the bus while the other is to drive a motorbike. Some backpackers would go hitchhiking, while I know some locals who cycled all the way there. How long is the bus journey? How much is the bus price? How much is the train price? What is the best train company to take from Ho Chi Minh to Mui Ne? Going to Mui Ne from Ho Chim City is not difficult at all. You can either take the bus, train. And if you are adventurous enough, I'm guessing you are doing a motorbiking in Vietnam, you can also get to Mui Ne from Ho Chi Minh City with your motorbike. Mui Ne is only 220 kms on a car from Ho Chi Minh. A lot of locals, expats, and travellers in Vietnam would go to Mui Ne for a beach time, kite surfing or windsurfing, and visiting the sand dunes and other tourist attractions. To help you decide which is the best way to reach Mui Ne, we are writing the options you can choose from below. Taking the bus is the most convenient way; hop on the bus, fall asleep, wake up, and you are there. However, before you decide to book your seat, check first if it fits your itinerary, budget, and needs. Most bus companies are airconditioned, some provide a bottle of water and a small snack. If you worry about the toilet access, most companies have a portable toilet installed as well. They may not be in the best condition, it does the job. The bus journey should take no more than 5 hours unless there are roadworks along the way, traffic jams or the bus company chose to pick up and drop passengers along the way. When I took the cheapest option for the bus, it took us 6 hours for this reason. If you have a limited time and your budget permits, take the bus that is a little more expensive but you know they will be on time. Before booking your bus ticket, double check where they will drop you off, Phan Thiet is still a few kilometres away from Mui Ne proper which you will have to take a taxi if they drop you off in the wrong town. You can find bus prices between $6 to $8. The expensive ones will stop lesser, have a toilet in the bus, more likely give out a bottle of water, snack, and wet wipes, they also offer great air conditioning and reclined seats. While with the cheaper ones, you can expect an older bus, weak air conditioning system, stops quite often, and the toilet is run down. You should also double check where they will drop you off. When I took the $8 one, they dropped me off Phan Thiet which was 4kms away from Mui Ne itself. The Sinh Tourist Cafe offers a VIP Sleeper for $7.50, where you can expect a great air conditioning, reclined seats up to 160 degrees, small snack, toilet in the bus, and one to almost no extra stop. The journey will be about 5 hours. But remember that there are a lot of fake Sinh Tourist Cafes flocking around Vietnam. We highly recommend you to take a closer look before booking a seat or else you might be a victim of a scam. If you want our recommendation, we suggest you book through this site which you can assure that all companies are genuine. The train from Ho Chi Minh City goes to Binh Thuan, which is about 40kms away from Mui Ne. From this station, you can take a taxi. Unfortunately, there is no direct train between these two places. The train ride from Ho Chi Minh City to Mui Ne (Binh Thuan station) is about 3.5 hours without big stops or 4 hours with stops in between. Then about half an hour to 45 minutes on a taxi depending on the traffic. A total of 4-5 hours. The price from between $8 to $12 depending on the seats that you want. You can choose between a hard seat, soft seat, and hard berth. There is a toilet on the train and a small area where you can buy snacks and drinks, there will be food trolleys around that goes into the hallway. You can get your tickets here. There is only one train company that serves this route, it's called Vietnam Railway System. Many backpackers in Vietnam buy a motorbike and drive across the country. If you will start your backpacking trip in Ho Chi Minh City, Mui Ne is a popular next destination after this city. You can buy a motorbike for about $280 and up in hostels or motorbike shops. 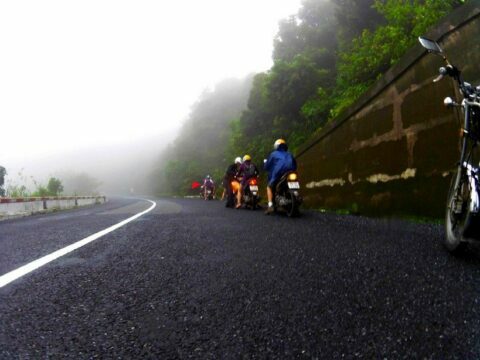 If you decide to do this, we highly recommend you to check our motorbiking in Vietnam article for all the tips and safety. Mui Ne is about 220kms, give or take, from Ho Chi Minh City. It takes about 5-6 hours to drive on a motorbike. If you leave early, you will get there before the sun goes down. However, if you are in no hurry, we highly suggest you stop by a small town in between. It is important to not push yourself and have a break. 5-6 hours is the maximum you want to go on a motorbike or else, you will be prone to an accident due to tiredness, your bike needs a break as well. Vung Tau is another beach town that most travellers on a motorbike head to before Mui Ne. You can find out more information here about getting there. There is a small number of expats live here while other travellers who have a spare time during their trip will go to Vung Tau for a day or two to relax. It's less busy than most places in Vietnam. We listed the places we recommend for you to stay in Mui Ne, you can also check our article where to stay in Mui Ne and Phan Thiet for more options. This luxury beach resort is well-located, has a swimming pool, bar area, fitness centre, and a private beach that you can enjoy. If you check the prices, it's pretty great deal for all the amenities and great features and comfort that their deluxe room offers to their guests. A fabulous breakfast is also included. This place is best for couples and those who want to relax for a few days in a very luxurious way. This hotel is great if you are looking for a relaxed vibe place to spend your holiday. They have a garden and hammocks set up. The price is very affordable as well for a private room where you get a double sized bed, air conditioning, your own bathroom, and a TV with cable. It is also very well located, there are nearby restaurants and the beach is only 2-minute walk. If you want a place that feels like a resort, this one is for you. For such great price, you get your own private room with a view, air conditioning, $2 add-on for breakfast, and an access to the swimming pool. They also offer spa and wellness services. The beach is only 100 m away, this is definitely a great deal. There are dozens of hostels to choose from in Mui Ne, they are mostly affordable, in a great location, and has their own swimming pool. Here are some of our recommendations, while you ca nalso check out best hostels in Vietnam list. 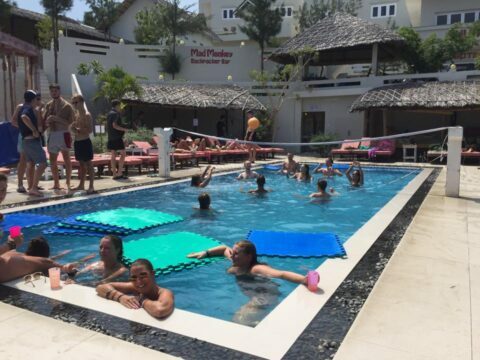 Is right between party hostel and a chill one, during the day, you can enjoy their swimming pool and great deals at the bar. 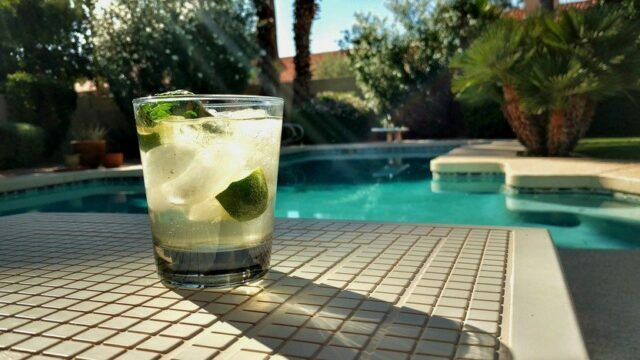 At night, they have games, like poker, billiards, and other drinking games. The best catch is their promotions for the drinks and food. It is also only a 3-minute walk from the beach. If you are looking for affordable tours, they offer the cheapest one in town. For backpackers who want a quiet time and loves camping, Long Son is perfect for you. You can choose between a dorm room or a tent. If you choose a tent, they will provide everything you need and you get to access the common areas just like in any other hostel. The tranquillity that they offer together with warmness and kindness of their staffs, there is no reason why you should not stay here. Mui Ne is a calm and pretty safe town, however, some situations are inevitable. During your journey from Ho Chi Minh especially if you are on a motorbike, make sure that you know where are the medical clinics and international hospitals along the way. Check out our list oh hospitals here. There are many places you can go after Mui Ne. But many travellers would go to Nha Trang or Da Lat which both can be reached via bus or motorbike. If you are on a motorbike, ask other people are travelling on a bike to or the receptionist of your hotel for some great tips. We hope that you found this article useful. If you have any questions or you see anything that we should correct, don't hesitate to comment below or contact us on social media or email.